Preheat oven to 500 degrees. Spray a 9X13" baking dish with cooking spray. In a large bowl mix together the olive oil, salt, pepper, paprika, garlic powder and hot sauce. Add the cubed potatoes and stir to coat. Carefully scoop the potatoes into the prepared baking dish, leaving behind as much of the olive oil/hot sauce mixture as possible. Bake the potatoes for 45-50 minutes, stirring every 10-15 minutes, until cooked through and crispy and browned on the outside. While the potatoes are cooking, add the cubed chicken to the bowl with the left over olive oil/hot sauce mixture and stir to coat. 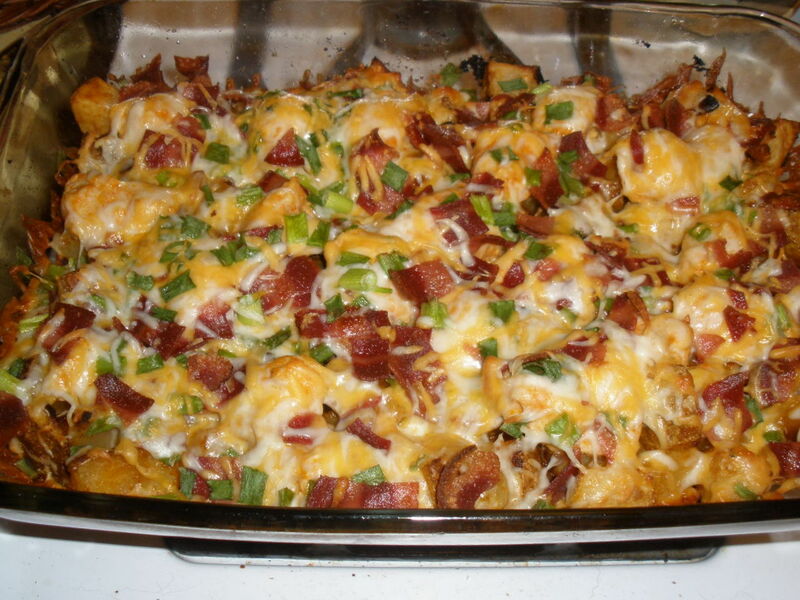 Once the potatoes are fully cooked, remove from the oven and lower the oven temperature to 400 degrees. Top the cooked potatoes with the raw marinated chicken. 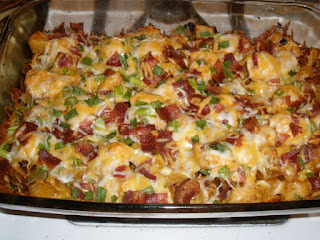 In a bowl ix together the cheese, bacon and green onion and top the raw chicken with the cheese mixture. Return the casserole to the oven and bake for 15 minutes or until chicken is cooked through and the topping is bubbly delicious.